Me Somewhere Else is a new exhibition featuring works by the Japanese artist Chiharu Shiota at Blain|Southern London. This is the artist’s first exhibition at the London gallery and includes one of Shiota’s site-specific installations, sculpture plus works on canvas and sculpture. 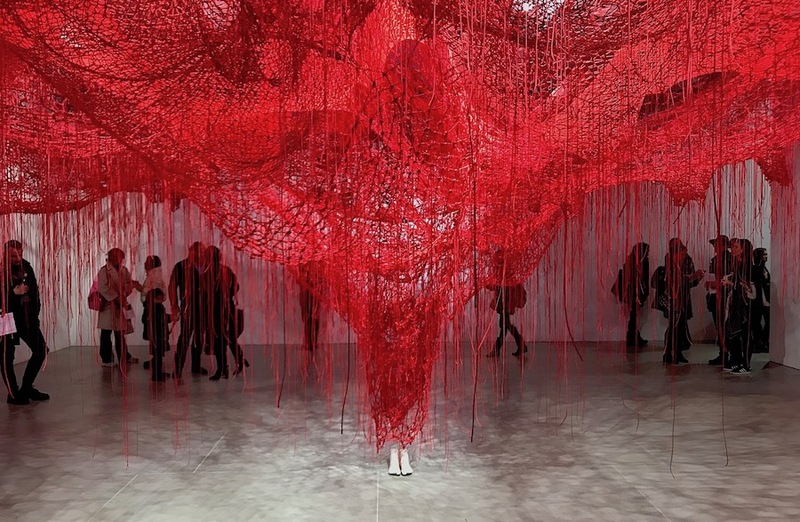 The titular installation Me Somewhere Else continues Shiota in further exploration of thread as a medium, but here she utilises the material in a markedly different way, using her fingers to knot red yarn into a vast net. Suspended from the gallery ceiling, the net is a billowing mass which rises from a pair of feet that rest on the floor below: cast from the artist’s own feet, their solidity and permanence contrast with the usually ephemeral nature of her installations. The colour of blood, the red yarn is laden with symbolism, for the artist, it alludes to our connectedness to each other, the interior of the body and the complex network of neural connections in the brain. Elsewhere in the exhibition, the geometry of new rhomboid sculptures echoes that found within her web installations, where seemingly haphazardly interlaced strands is a network of triangles. Two-dimensional canvas works further explore the artist’s use of thread as a medium. Shiota studied painting early in her education but restricted by the use of canvas and paint, she began using her own body in performance pieces, and later began to use thread as a mode for formal and conceptual expression. It allowed her to remove her physical presence yet still address the ideas that are central to her practice. Her canvases can be viewed as this journey coming full circle. Born in Osaka, Japan, in 1972, Chiharu Shiota has been living and working in Berlin since 1996. Shiota museum exhibitions include: Art Gallery of South Australia, Adelaide, AU (2018), Kode Art Museum, Bergen, NO (2017), Kunsthalle Rostock, DE (2017) Kunstsammlung Düsseldorf, K21, Düsseldorf, DE (2015), Freer and Sackler Gallery of Art, Washington D.C., US (2014); The Museum of Art, Kōchi, JP (2013); La Maison Rouge, Paris, FR (2011); National Museum of Art, Osaka, JP (2008); and MoMA PS1, New York, US (2003). Shiota has represented Japan at the Venice Biennale, 2015; and was also selected for Aichi Triennale, 2010; Gwangju Biennale, 2006 and Yokohama Triennale 2001, amongst others.